President Byerly speaks with alumni in the Marlo Room. 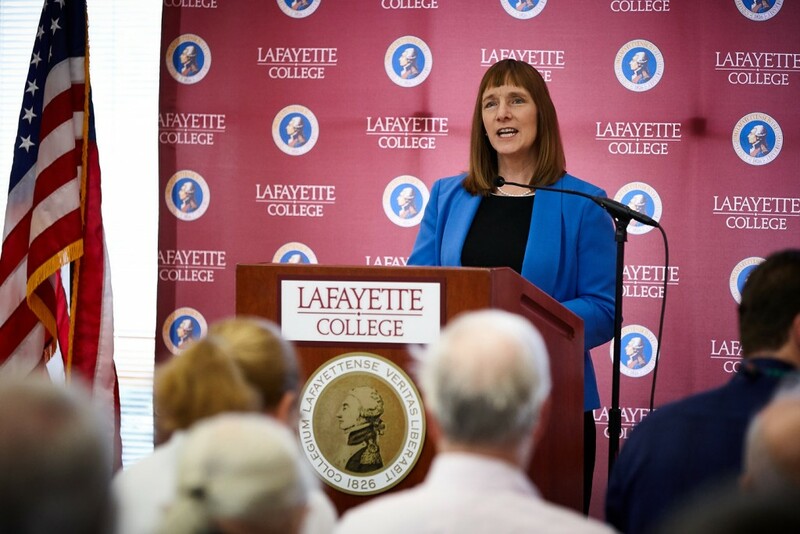 The picturesque small College they attended accomplished great things in 2016, Lafayette President Alison Byerly told a gathering of alumni Saturday, and it’s poised to ascend to higher plateaus in the coming years. Outside Farinon College Center, where Byerly gave her yearly update, alumni from throughout the past half century milled about the Quad, prepped for a parade and recognizing old friends. Lisa Kassel ’79, the new president of the Alumni Association, introduced Byerly. It was Reunion Weekend, and central to the stories Byerly had to share with the College’s alumni was a new strategic direction, approved in February by the Board of Trustees. 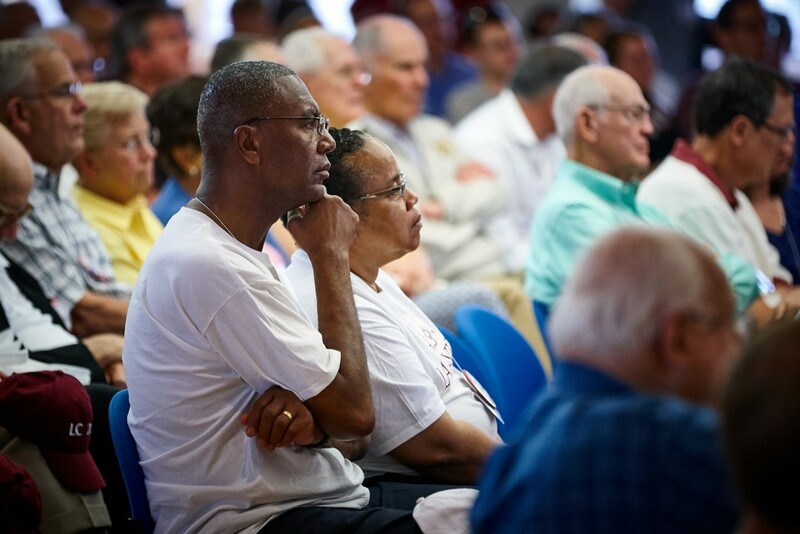 Andre ’76 and Winona McDaniel listen to President Byerly’s talk. In the coming years, Lafayette will invest more money in financial aid, increase the size of its student body by 350 to 400 students, and add 35 to 40 new faculty members. A more diverse Lafayette will emerge, and the College also plans to enhance faculty recruitment and retention by reviewing and increasing the salaries it pays its instructors. It was a year of change and accomplishment in the College’s ever-evolving history, Byerly said. The Live Connected, Lead Change campaign has raised $300 of its $400 million goal. 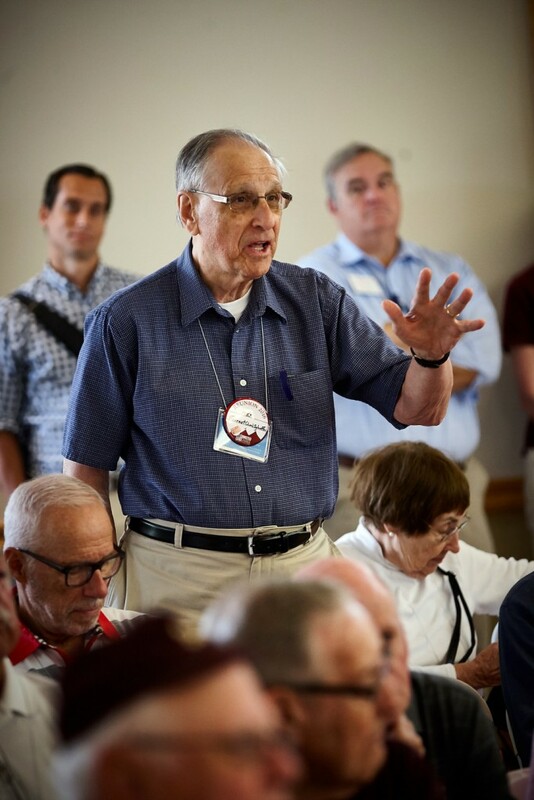 Forrest Schaffer ’55 asks a question. Lafayette launched the Connected Communities program, which seeks to connect residence life to academic programs and student advising with the goal of supporting the diverse academic and developmental needs of students. New students were assigned to one of five Commons, which served as the foundation for their first-year experience. The Office of Advising and Co-curricular Programming hired and trained 21 PARDners as peer advisers for the new class. Faced with the nationwide racially charged unrest on College campuses, Lafayette took an active approach. The More Than Mizzou event in December saw more than 400 student, faculty, and staff members discussing racial issues on campus. A speaker series, Activisms: Leading Social Change, included poet Richard Blanco and famed civil rights activist Diane Nash. Byerly highlighted the College’s many milestones in 2015-16, including its many scholarship and grant winners. Incoming Leopards look equally as promising. Byerly mentioned the successes of the admissions department, which brought in a diverse Class of 2020. Currently, the Class of 2020 has 673 members, and the college expects 650 students in the class on move-in day in August. In the coming year, Byerly said, the Williams Arts Campus will officially open at the bottom of the hill, offering new opportunities in downtown Easton for the College’s growing arts community. In 2016-17, Lafayette will also celebrate the 150th anniversary of the founding of its engineering program, with a variety of events and activities for students, faculty, and the community.